Get a bigger heater, and spell check. Also, see if bypass valve is open. Where is that bypass valve located..... in/on the tank? 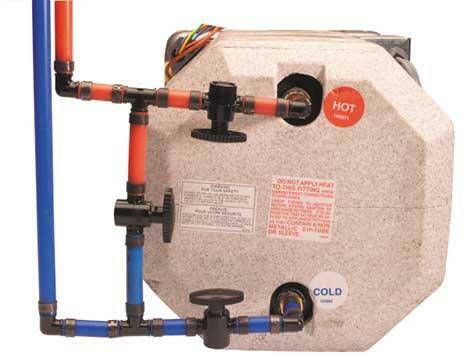 If the valve at the red and blue pipes is open the water will bypass the heater. Flush tank and change anode rod. When was the last time you've done that? I have the same problem with mine. I just turn it on and off about 5 or 6 times and it starts working normal again. It seems to be a problem with the air in the propane line.... I always fire up the stove and let it run for a few minutes then kick on the water heater and fridge to bleed out the lines. I know the first time I did my WW it was full of stuff.